as this is peak time on this holiday area, camping and accommodation will be hard to find. Thanks for the dates Gordon. We have had a mention on the Taipan forum and they are thinking of laying down the challenge to us. May not be such a bad idea. We both have the same issue come layday, a whole lot of tired sailors with bored kids. Why not inject some fun for the families with the added spice of an inter-class challenge. if you want a site contact mandy at the rosebud foreshore office on 03 59501011 mention gordon hyde/ rye yacht club and they will know what you are talking about.. leave it till too late and you will miss out as these sites will be gone by the end of next week�..
Are there any Qld/NSW members who are planning to attend the 2015/16 nats . Hopefully there will be more than one Mossie from the Northern states . Let me know and we could maybe organise accommodation, from Gordons advice it looks like we have to decide quite soon. Does that mean there is no camping available at Rye? We were hoping to camp close to the Rye Yacht Club rather than in Rosebud. areas near rye will be booked by regulars each year and other sites are by ballot..you need to get in early. the rosebud option is the only one that the foreshore ranger has been able to arrange..and rosebud is only 5 mins down the road..and Mandy has said that that too will be gone soon... holiday homes in the area are another option but may be more expensive and would need to be book NOW as these will also be gone VERY Soon..
Just rang the Rosebud Foreshore Office... Mandy wasn't there and the person I spoke to knew nothing about any arrangement for Rye Yacht Club. She more or less said there was little hope of getting any site during the peak season. She also was unable to tell me when Mandy will be in the office. The STAYZ website has holiday houses in the area. Like this one which from the map appears to be right opposite the Yacht Club. It's a matter of finding enough others to share a place like this with - to make it more economical. There is an advantage of course - getting to sleep in a real bed for the week. This is why we like to hold titles at places where we can camp at the club - but it can't always be done unfortunately. We have heard from a fellow RYC member that the Bayview Motel in Tootgarook (about 2km from the YC) has open reservations at very reasonable prices over the Nats dates. Hope to see as many of you there as possible. 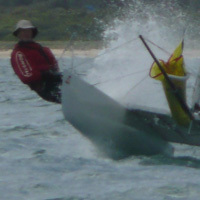 Hello I am looking for someone which I could crew for in the mosquito nationals, I live in tassie and it is to expensive for me to bring my boat over. So if anyone needs a crew please contact me on fynharding@gmail.com , I am 190cm tall and and 80kg, I have had lots of experience sailing so hit me up. A revised NOR will be uploaded to the web page shortly, we have finally been able to locate a venue for the presentation on Saturday night, this will be held at the Rye Hotel the cost for entry went up by only $5 for Mk1 and $10 for Mk2 to cover this. the new venue will allow for a much bigger venue than the clubs limited upstairs area. look forward to see you at the nationals. The "early-bird" entry fees for the Rye Nationals finish at the end of November so don't delay getting your entry in. Wow the entry list looks interesting, Spinnaker rigged Mossies out number other rigs. Also good entries of sloops, as there is bound to be a few more. All you Cat Rig sailors had better hurry up and get your entries in, you might get away with not paying the late entry fee if youre lucky. Let me know if you have a boat available and I will give you details for Mitch, Robbie or Michelle.